Hillsdale, MI. For the first time ever we went snowbirding, driving from balmy southern Michigan to the Florida Panhandle for a couple of weeks of refuge from the white stuff. Funny, but the beaches of Destin look just like our driveway: white. And the trip, almost straight south, about a thousand miles, yielded up a refresher course in family, church, and local community. 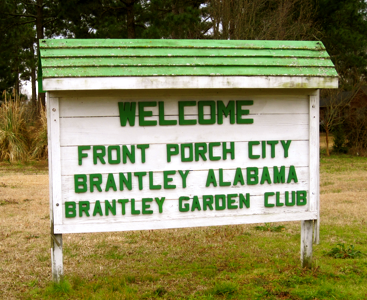 The little town of Brantley, Alabama, south of Montgomery on Rt. 331, has this welcome sign. We noticed on the way back that all the porches on Main Street in Brantley have rocking chairs. They really do want you to stop by and “set” a spell. In Destin, Florida there is an inn called Henderson Park, right on the Gulf of Mexico, that looks rather New Englandy, and is as welcoming as a Front Porch city. The restaurant, Beach Walk, is not only good (the venison steak is to die for), but is run by a family–the Creehans. Tim is the chef, Marah runs the staff, and Momma is the boss. She says she is going to retire this June. They greet their customers as friends and neighbors, and they all seem to like each other. Up the road from Birmingham is the small town of Cullman, Alabama, just off I-65. Cullman is a prosperous-looking city, and has something that is unique to Alabama–a Benedictine Abbey, St. Bernard’s. On the monastery grounds is one of the wonders of the world, the Ave Maria Grotto. We stayed there innocently, never having heard of the grotto. Brother Joseph Zoetl, O.S.B. 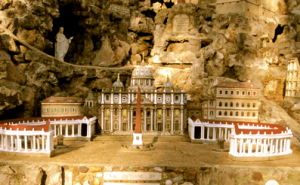 (1878-1961) spent almost seventy years of his life making miniature buildings, copied to scale, of many of the world’s Catholic churches, monasteries, missions, and temples. He did it all from his reading of history and the Bible, and the inspiration of the Holy Spirit. He used stone from the Abbey grounds, concrete he mixed himself, broken plates, cold cream jars, costume jewelry, ceramic tile, seashells, bits of marble, and almost anything else he could find or convince local people to donate. His statue is in the Grotto: Brother Joseph was about five feet tall and as we now say, physically challenged. In this picture of his image of St. Peter’s in Rome one sees almost four acres of his work set in gardens that lead visitors through his spiritual journey. So, on the road again, we rediscovered the meaning of Place. Limits. Liberty. John Paul Willson has been a teacher for 48 years, most of them at Hillsdale College. He retired in 2005 (after around 12,500 students, 78,000 papers and exams, and 4000 meetings) but can't seem to get retirement right. He has been the second oldest in a five-generation picture. He still coaches punters and placekickers and plays a lot of golf. One wife, Helen; three daughters and ten grandchildren. Happy Catholic. A friend of mine gave a link to your blog on her Facebook page; she lives in Brantley, and I live in nearby Rutledge (if you came down 331, you came by us!). You’re right, Brantley is a very friendly town, as well as the other towns in our county. We’ve been raised right- we like to see our neighbors, and we like to make new friends. Thanks for sharing our wonderful area with the world – next time you’re through, stop by some of the local places- I’m sure they’ll make you feel right at home! John, thanks for this. It lifted my spirits; a little hope when hope seems lost. I’ve always been fond of the Alabamians though I’ve only known a couple; they were young men I met in basic training. This reminded me of the young Alabamians at Gettysburg. The young men from a military school whose name I’ve forgotten, those young men who died just north of the copse of trees. They kept their lines in the face of their enemy’s shot and canister, they did not waver, they were true to their place. I figure a man can’t ask more than that. Grandmother Kseniya Ivanovna was totally unable to adapt to city life and didn’t want to change her habits. In the village she was used to sitting outside on a zavalinka [mound of earth around peasant homes–Trans.] and spending hours chatting with neighbors, and she continued this in Moscow. But Moscow was not Kalinovka, and in the 1930s a heart-to-heart talk could cost you your life. That was why Father worried.